Hello. Today is one of those days that you never forget. One of the amazing opportunities that I've had while serving as the 2007 / 2008 Missouri Teacher of the Year happened today as I met President Bush in the Oval Office of the White House. Of course as a history teacher and political geek that was beyond cool. It also seemed surreal as I had the chance to have my picture taken with the president and then participate in a Teacher of the Year ceremony at the Rose Garden. I sat down and recorded a podcast before I went to bed for the night - in part so that my 8th grade students back in Liberty could share in the experience in class on Thursday. I have included some pictures that I took during the experience at the White House. I had a great seat on the isle during the ceremony at the White House and can't believe how great the pictures turned out. Congratulations to our new 2008 National Teacher of the Year - Michael Geisen - a 7th grade science teacher from Oregon. He will be an amazing representative for all teachers across the country and I hope many of you will have the opportunity to see and hear him speak as he travels this year. Hello. This year as I have the honor of traveling the state to as the Missouri Teacher of the Year at banquets, conferences and conventions I often record the presentation with my portable iRiver MP3 player. I usually don't produce the presentation but at times it does fit into one of the three themes of this podcast - education, history or technology. Today I am podcasting the speech I gave at the 2008 Missouri Daughters of the American Revolution banquet held on April 5 in Columbia, Missouri. It is a great organization that does amazing things to promote American history in our schools through student contests and scholarships. Lois Allen of the Missouri Daughters of the American Revolution and myself at the 2008 state convention in Columbia, Missouri. Hello. This podcast is a little different - more of a request for information. I am currently considering starting the process to become a Nationally Board Certified teacher. In the past there was no incentive in my district to become certified but starting next year they will offer a $4000 stipend to each certified teacher. I am currently in the very early stages of checking out the process. I'm aware it is a process that costs roughly $2500, I should expect to spend somewhere around 400 hours on the process and it is very reflective. Are you a National Board Certified teacher? What advice would you have for a teacher such as myself that is just starting to look at the process? If you would like to offer advice or share your experiences please leave a comment on the post for all to read and share or send me an e-mail directly at speakingofhistory@gmail.com Thanks. Hello. Today's podcast is the audio from a presentation I gave at the MASL (Missouri Association of School Librarians) Conference at Tan-Tar-A Resort in Osage Beach, Missouri on April 14, 2008. 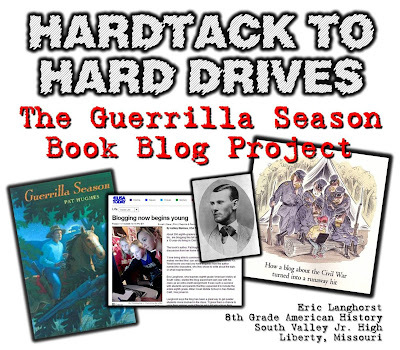 We have recently completed our Guerrilla Season book blog project - our second book blog project with this book by Pat Hughes in the past two years. I feel this project is one of my more sucessful personal applications of Web 2.0 in my own classroom. The podcast is the audio of the presentation and is about 50 minutes in length. I do mention a wiki that has all the links to articles, sites mentioned, etc. during the presentation and that URL is listed below. I also show a short video describing the book blog project and that is available to view using the link listed below.